"What had being the parent of a murdered child taught her? Nothing--nothing except the inexhaustibility of her own anger, anger at constantly being reminded of what she'd lived through, what she'd always be living through, and most of all anger at the presumption that she should be over it, that she should have proved that life goes on, if not for her sake then for the sake of those around her. That was never the hard part, Sis thought. Life went on anyway, whether you wanted it to or not. The hard part was being left behind to breathe out the ghost of the one who'd gone on." This beautifully tailored quote encapsulates the heart of this book. 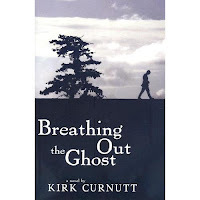 It is a book about the soul rending grief that each person struggles with in a different way. Those of us who have not suffered such a loss cannot fathom the anguish of a parent too soon separated from their child. One cannot possibly know how grief affects a person until they have suffered it for themselves. Oh, how I pray to never be put in a position of finding out for myself. The characters in this book are so well drawn you will feel like they couldn't possibly have come from Mr. Curnutt's imagination. Each person is different as can be from the next, yet they all embody deep inner lives, some filled with despair, some with a need to be a savior, some with the tender touch that draws other sufferers like bees to a Spring blooming flower. Breathing Out the Ghost is not a pleasant ride. You don't read it for pleasure, rather you read it to remember that there was still deep and powerful feelings within yourself, the most powerful being that of powerlessness. You read it to remember that deep inside the most self-destructive of men is a hurt soul trying to find succor by any means. It is the story of St. Clair, the father of a kidnapped boy who has abandoned his family in search of his son because he cannot stand to sit at home doing nothing. It is also the story of Heim, the former private investigator who lost his license trying to help St. Clair find his son but now is just trying to save him from self-destruction. And lastly it is the story of Sis, the mother of a murdered daughter who cannot avoid the pit of despair that is St. Clair because she understands all too well what drives him. There is violence and ugliness enough to go around and several distasteful scenes that made me want to turn aside. But ultimately it is a wonderfully written book that shows us the different faces of grief and how suffering affects different people differently. I have one complaint. I'm just an average reader who doesn't usually pay much attention to grammatical errors because my own writing wouldn't hold up to scrutiny very well. Simply stated, this book is in need of an editor. Seriously. Look at this sentence: "I suppose I could have to gone to pieces like this friend of yours..." This type of mistake along with missing punctuation marks and a name misspelled was made often enough to be a serious distraction. A book like this deserves better care than that. I hope the publisher has corrected these mistakes already. I'd like to say a great big thank you to Kirk Curnutt who graciously sent me a second copy of his book when the first one mysteriously disappeared in the mail. (I'm convinced the post office is littered with readers when I hear how often books disappear in their care.) You can find his website here. Sir, I have read all your guest posts and interviews and I believe you succeeded admirably. Very good job. Monday, January 5th: Diary of an Eccentric Excellent review and interview! Monday, January 12th: Savvy Verse and Wit Review, interview & giveaway! I really want to read this book, but I think I'll need to be in the right frame of mind before I take it on. Fabulous review! Thank you so much for participating. I'm sorry to hear about the editing issue though, but the way you stated it ("a book like this deserves better") shows how highly you thought of the writing. bermudaonion-I chose to read this after the holiday season because it sounded too dark. I'm glad I did. LisaMM-I do think the writing was fabulous. The lack of editing was the only disappointment in the book. My copy of the book did not have that many errors in it...I saw no more than the norm. But then again I could have been too engaged in the story to notice the errors. Thanks for posting you review. I loved it.